This blog is an archive of miscellaneous micro-history reports pertaining to my paternal Curry line and its variant spellings over time (Currey, Corry, Correy) including sub-lines Andrews, Finley, Jack, Moody and Moore, and on my maternal side, the Willis family with its sub-lines of Bettle and Bolton. My intention is to fold this stuff into a more coherent family history website down the road. In an earlier post, William Jack Curry, Sr. -- Ceramics Pioneer, I recounted some of my Grandfather's early life but focused mainly on his business career. While Jack was a hard-working, teetotaling Presbyterian and one of the very few in town who voted the Prohibitionist ticket, he was also a well-liked, fun-loving member of the East Liverpool, Ohio community. I would know little of this were it not for several surviving records that show his lighter side. Some twenty years ago, my Uncle, Matthew Andrews Curry of East Liverpool, Ohio (ELO) came upon the logbook that is the subject of this post. It was in a box of yellowed, musty memorabilia that belonged to his father, William "Jack" Curry. Mac passed the book along to his niece, my sister Jane Louise Curry, a noted children's book author. Jane worked at transcribing the logbook to a digital file in her spare time over many years and finally published her record in 2007. The original record book is now in the possession of the East Liverpool Historical Society. Jack Curry was one of the organizers of the Forest & Stream Hunting & Fishing Club and served as "Camp Boss" and logbook scribe. "Jack", by the way, was his actual middle name, which honored his mother's family name. The Club held camp for several weeks each summer at various sylvan retreat locations within a half-day's wagon ride from ELO (see map below). 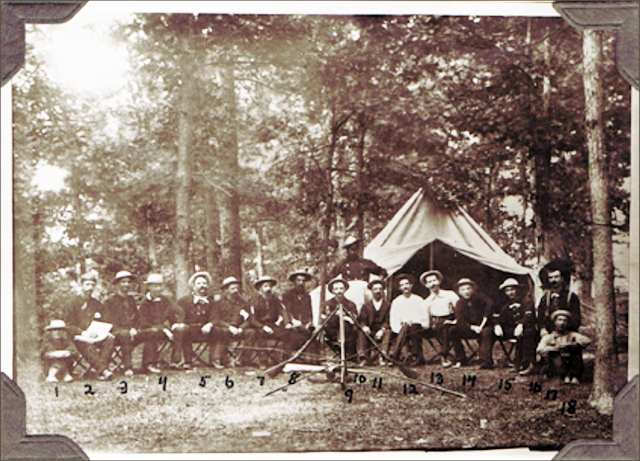 In 1882 the camp was staged at Gaston's Mills, the general area now well-preserved as part of Little Beaver State Park. In the years of 1883, '84 and '85, the camp was located on the Loudon farm at Dobson's Mill on the south side of the West Branch of the Little Beaver near the Morgan Surrender Monument. The campsite was moved to Camp St. George at "Madison Square" during the five summers of 1887 through 1891. All of the encampment adventures took place adjacent to mill sites on the bucolic Little Beaver Creek. The millponds enabled boating in skiffs, plus good fishing and turtle catching opportunities. No mention was made of the rent paid to the property owner but in one instance several members spent an afternoon hauling "hay doodles" for the farmer, perhaps to offset the rent. OK--what on earth is a hay doodle? It's simply a small piled-up stack of loose hay about four feet high and the same in diameter, that would next be hauled to a haystack. Jack Curry's handwritten logbook of daily activities recounts in great detail the names and dates of the comings and goings of each club member and visitor, the supplies consumed, the fish caught and squirrels shot, the pranks laid and games played. It is a wonderful diary of a simpler, slower life when people made their own active entertainment rather than passively mainlining it from an electronic screen. At least one day of each camping week, usually Thursday, was designated as "Ladies Day." Camp members would either provide several horse-drawn wagons or they would hire commercial hacks (carriages) to convey a bevy of eligible young women from East Liverpool to the country for a day of picnicking and innocent fun. Without fail, a married couple or two would be present to give social sanction to these exciting comminglings of the sexes. Quoits, a game much like horseshoes, where metal rings are thrown to encircle a steel post, was very popular on these occasions. Baseball and boating on the millpond rated highly as well but the most anticipated activities were the "play party games." These were not your mother's party games but an earlier American folk tradition where people sang out and danced to popular ballads. Using the word "game" in this instance was a pious fiction to avoid reference to "dancing," which was considered SINFUL. The dance aspect of party games was very similar to square dancing, though the games were often performed in a circular ring instead of a square. The main difference between play party games and dancing was that the participants provided their own music by singing without instrumental accompaniment, whereas "dancing" was often done to the tune of a fiddle--an instrument considered in some parts to be the Devil's own! And they were Irish too. After a day of vigorous outdoor activities, the members bade their female guests adieu in the fading afternoon sun, waving goodbye until the last carriage passed out of sight. Everyone was, no doubt, happily exhausted! Sundays in camp were strictly observed with members attending Sunday Schools and sermons at nearby churches. Fishing and sporting activities were decidedly frowned upon. Otherwise, general laziness was the order of the day. Also, in keeping with this sober tone, there was no evidence of any alcohol use in camp, ever, other than the night their beloved black cook, Sidney Gwinne, got a supply of liquor somewhere and experienced a hallucinatory episode where he was found with a shotgun in the middle of the night, fending off ghosts and imagined snakes. There are some cringe-worthy racial references in the log made by a substitute secretary that remind us that this was a more callous time. It was heartening, though, to see the deep bonds of respect and true friendship between Jack Curry and Sidney Gwinne. It's also interesting to witness in Jack's log that hunting and fishing were carried out year round back then without respect to breeding seasons. It was pretty much open warfare on anything that walked, crawled, flew or swam. Neither chipmunks, skunks, flickers, owls, frogs or groundhogs escaped the onslaught and there were no bag limits. This wanton destruction of wildlife through sheer ignorance decimated many species in those times and even exterminated the passenger pigeon. The backlash to these practices ultimately led to the creation of the conservation movement in the early 20th century and the science of modern wildlife management. While we can criticize our forebears for their lack of environmental consciousness, we do this with 20-20 hindsight. They lived in the fading twilight of the Man-versus-Nature American frontier when we learned many hard lessons that our natural resources weren't inexhaustible. So now come with me, 135 years back in time, to Gaston's Mills where we find our intrepid troop having the times of their life...none of which would ever be remembered but for the faithful efforts of their historian, Jack Curry. Like many family historians, I get frustrated that my ancestors left so little information behind to illuminate their personal lives and times. But then I remind myself that these were modest, religious people who struggled hard just to care for their families and put bread on the table. Their lives were lived in the moment through good times and bad. Little thought was given to self-reflection. Diarists were few and far between. So, let's just be thankful when any one of our folks took the time to record births and deaths in a family bible or capture fleeting experiences in a photograph. This yellowed and torn "cabinet card" photograph showed up in a pile of old photos that were part of my Dad's (WJC2) estate. No names, no explanation but plenty intriguing because of that window sign "Curry's Cigar Factory." Every time I came upon this curiosity over the years, I'd ask it questions and listen for answers as though it was a Ouija Board: Who were those four guys? When was that photo taken? And, where was this business anyway? Hearing no whispers from across the mists of time, I finally decided it was time to call in—drum roll—the History Detectives! The address on the front side of the card—Thackeray & Kraeling, 99 Fifth Avenue, Pittsburg, led me (and my father before me) to first guess that the cigar factory was located in Pittsburgh's "Old Allegheny" section (the "North Side" where the Steelers' stadium is now). While just a guess, it did make some geographic sense: William Ezekiel Curry, my Great-Grandfather, owned property in Old Allegheny that he received from Dr. Joseph Curry’s will. 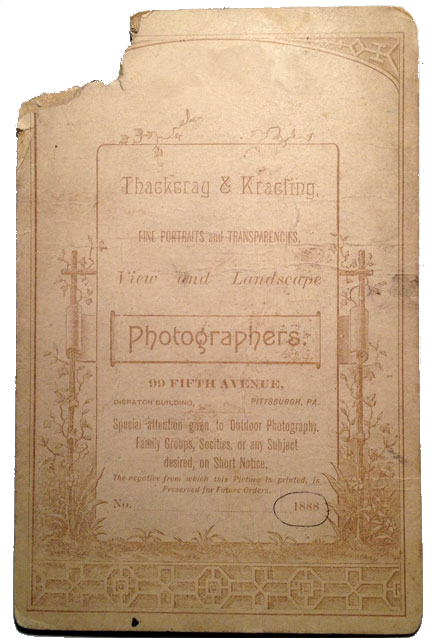 The reverse of the card advertises Thackeray & Kraeling's photographic services. It also bears the pre-printed year of 1888 (encircled below). This can't be relied on to conclusively establish the year the photo was taken because T&K could have printed it on old, out-of-date card stock. Still, it does enable us to say it was taken sometime in 1888 or after. One Internet source confirms this time frame by stating that cards with elaborate advertising covering most of the reverse side were prevalent between 1888 and 1900. Imagine for the fun of it, how this photo might have come to be. One of these partners...let's call him Elburt Kraeling, is a paunchy, itinerant photographer whose modus operandi is to slowly shuffle his one-horse buggy along dusty commercial streets, all the while casting a sharp eye for prospective customers. Strapped down on the seat beside him is his large format bellows camera, a tripod, glass plates and other paraphernalia. Spying the Curry Cigar Factory, he pulls to the side and ties his sway-backed mare to a hitching post. Mounting the entry porch, Elburt pulls a beaming smile and marches through the door. Looking around, he booms out, "My, what a impressive seegar emporium you fellers have built here." Turning to a gray-bearded elder who appears to be the proprietor, he asks, "Now, might you have a half dozen of them fine, hand rolled tobies that you'd apply as a discount against me taking a professional photograph of your establishment? Would sure make a good advert for your business, too. I kin do that deal for two bucks and give you a dozen cabinet cards." After conferring with a younger, mustachioed man, the senior man says, "We'd druther be dressed in our Sunday best for an official photograph but I guess we cud do it now in our work duds for a dollar and six bits." Hands are shook and the four rumpled looking cigar men file from the building. Elburt sets up in the street as the men arrange themselves outside the door. "Hold it now, gents," says Elburt and the men stand stiffly for serveral long seconds as the plate is exposed to the light by removing and replacing the lens cover. And so, a moment in time is captured...a moment that will be unexpectedly resurrected some 120 years later by the old man's Great Grandson! OK, enough fantisizing! Maybe I'll get further if we can ID the cigar store four. The old gentleman in the white whiskers is obviously William Ezekiel Curry (WEC) and the mustachioed younger man second from right looks like my Grandfather, William "Jack" Curry, Senior (WJC1), affectionately known as "PopPop" Curry to us kids. As for the guy on the left, I was immediately struck by his resemblance to my Uncle Mac, Matthew Andrews Curry. I think he might be PopPop's younger brother, Frank Foster Curry, but I need more evidence. The older bearded fellow on the right is a mystery but I have a hunch that he may be Robert Ewing Moody as I explain later in this post. This portrait of William Ezekiel Curry, (b. 1827 - d. 1898), yields a positive ID to his older image in the cigar store photo. As parents of Mame and Jack Curry, William Ezekiel and his wife, Letitia Jack Curry, are the common ancestors that tie the Curry & Moody lines together. They are the Great Grandparents of me and my sisters, as well as of Brenda and Bruce Moody. The photo below is a young, Jack Curry, who was a lifelong CIGAR aficionado. Also note the mustaches in both photos. At first, I rejected the idea that the he was the same guy in the cigar store photo because the hair parting lines don't match: One's on the right side of the head and the other is on the left. Then, I realized that the cigar-in-mouth shot is a tintype which means it is an original negative image and not a printed positive. That means both hairlines are really on the left side and they certainly could be photos of the same person, taken ten or so years apart. 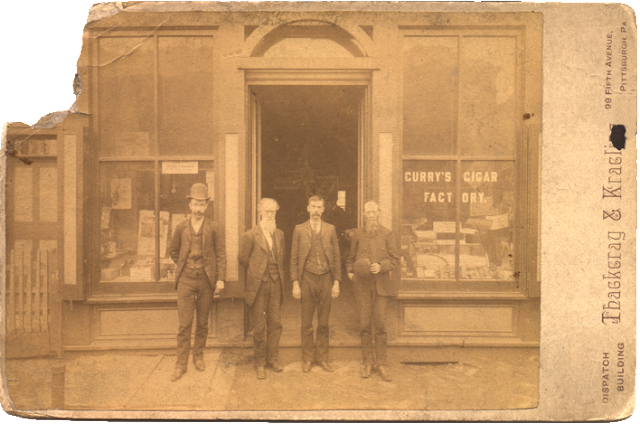 Mr. W. J. Curry has opened a cigar store and factory, in Burgess’s building, Fourth street. “Jack” will continue in his present position at R. Thomas & Sons, while W. E. Curry will manage the cigar business. What a great find! We now conclusively know the location and startup date of the business. Since Jack Curry retained employment at R. Thomas, & Sons, it appears he started the factory/store both to supplement the family's income and provide work for his father and brother. From the few facts we actually know, William Ezekiel Curry's business career appears to have careened from failure to failure: He dropped out of Washington College, Washington, Pa. before graduating; worked as a pharmacist for a short while in Johnstown, Pennsylvania; farmed on his father's land southwest of Pittsburgh in the 1850's; then started a lumber business in the early 1860's on property willed to him by his father in Old Allegheny. In 1866 he moved to Darlington, Pa. and farmed land bought in his wife's Letitia's name. After the tragic loss of two teen-aged children, Emma and Harry, the family moved to East Liverpool, Ohio in 1873 where, for a time, he sold furniture and caskets in partnership with a man named Anderson. I graduated [from high school] in June 1884 and took the teacher exam, received a good certificate but did not have the luck to get a school. I was determined to get one so I could help Father & Mother out. We had lost a great deal of our money and my sister Anne’s husband was drowned in a steamboat disaster & we had to take care of her & her four children. Those who expect to buy cigars for their gentlemen friends for Christmas presents, would do well to call at Curry’s and get a good article for as little money as you would pay for an inferior cigar at other places, as we deal exclusively in the tobacco and cigar business, and can therefore suit any and all customers. I also found a listing from the 1891-92 Columbiana County Directory that identifies Frank F. Curry as potter and cigar maker with a business address of 127 East Fourth St. (and a home address of West East Drury Lane), East Liverpool. 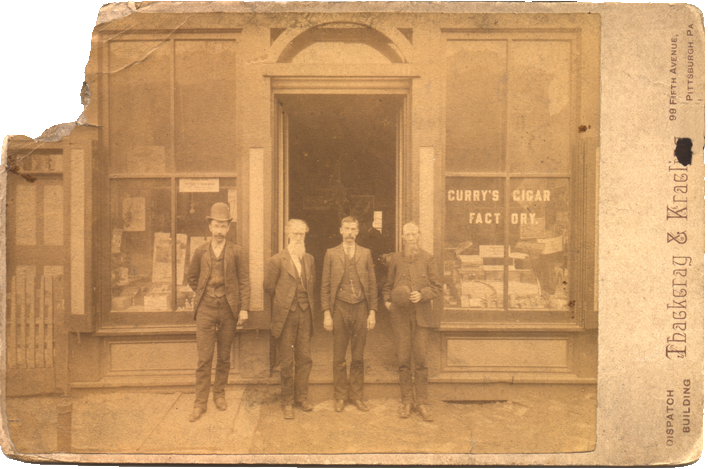 Not only did this reveal the exact location of the store but Frank Curry's stated role as cigar maker also makes it highly probable that the young man on the left in the photo is Frank. While cleaning a window at his store on Fourth street yesterday afternoon, Frank Curry was so unfortunate as to fall through. Although the glass was broken, the merchant was not injured. If the photo was taken during 1895, the last year of record for the store, William Ezekiel would be a 68 years old, Jack Curry would be 35, and Frank, 32. Judging from the age appearance of the men below, 1893-1895 appears to be a reasonable date period for the photograph. This may also have been near the end of the cigar store business, as Jack at that time was focussed with Frank's assistance on the startup of his new venture, the Old Roman Wall Plaster Company. 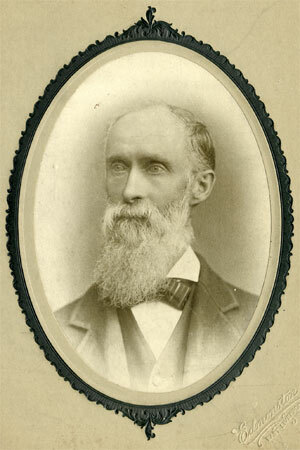 His father, William Ezekiel Curry would pass on a few years later in October 1898 at age 70. Frank Curry (photo left) was a total enigma to me before I followed this story down the rabbit hole. I never heard my father talk about this uncle at all—probably because Frank wasn't around when Dad was growing up. Online research, however, yielded helpful tidbits. The 1900 U. S. Census, the year his mother Letitia died, found Frank working with Jack making plaster. He and his brother were boarding at the East Liverpool home of his sister, Annie Curry Johnson. This aging pair of bachelor brothers, then 43 and 40 years of age, were broken up when Jack married my Grandmother, Dora Andrews, in September 1903. Being the odd man out may have contributed to Frank's decision around that time to move from ELO. Frank next surfaces in the 1910 census. He's out in Goleta, California, a rural town near Santa Barbara, where he worked for 20 years as a laborer in the walnut orchards and ranches. I imagine he went out to the Santa Barbara area to be near his sister Mary (Mame) Curry Moody, yet I never heard of any association of his name with Santa Barbara or the Moodys until I uncovered this info online. I also found Frank's Goleta precinct voting records during this period. As a dutiful son of teetotaler parents, he voted for the Prohibition Party from 1910 to 1918 and then switched to the Republicans. The 1930 U. S. Census, has him living at 119 W. Victoria Street, Santa Barbara, at age 68 and still classed as an active laborer. It's sad to think of Frank as a lone, elderly, worn-out farm laborer in that "Grapes of Wrath" depression era. Hopefully, Mame was there to support him in his final days. Frank Curry died in California, September 14, 1931, after a six-month bout of heart disease. His East Liverpool obituary related the surprising fact that he had been a chiropractor in that city 30 years previously. It was also stated that his body would be returned to Ohio for burial. Unfortunately, there is no record of his interment in the family's Riverview Cemetery. The Crisis was East Liverpool's Democrat newspaper during that era. Sort of surprised me to see that a store owned by a Republican/Prohibitionist Party family would carry this paper but, like most cigar stores of that time and later, local and regional newspapers of all sorts were sold to attract customers on a regular daily basis. This magnified snippet came into clearer focus with my recent discovery of another startup article in the East Liverpool Saturday Review of 1886. It revealed that Jack Curry's future brother-in-law, Elmer Moody, and his brother Ed Moody, operated the news stand within the cigar store. The Moody Bros., (Ed. 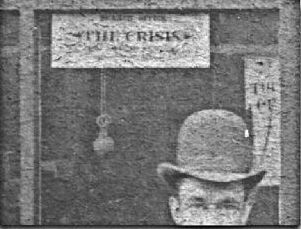 and Elmer) have opened a news stand on one side of the room just occupied by W. J. Curry as a cigar store. So I went over to Fairview West Virginia to a teachers institute & was going to take the exam but I got word from home that I had been appointed to a school 2nd grade. Met some nice people & one boy Clem (I’ve forgotten his other name) took me for several buggy rides. Then I saw a man across the room & and I said to my friend Emma M, why but that’s a handsome fellow over there. I would like to meet him and just when he started over in our direction with a girl I knew & she came up & said, Mame this gentleman wants to meet you. It was Elmer Moody. I had never seen or heard of him before. Guess it was love at first sight. We had a lovely time during the rest of the institute, had lots of buggy rides. Elmer had a horse & buggy too. I remember the horse’s name was Dolly. Elmer got a school at New Cumberland with the handsome salary of $60.00 a mo. & I went back to E.L.O. and taught my 2nd grade school at $30.00 a month. Elmer came up to see me quite frequently and in less than a year [ca 1885] we were engaged. So started to save up to get married some day. I wanted to buy a piano and gave Mother $10.00 a mo. Elmer had to help his folks & would no more than get a little ahead when taxes or something had to be paid so we struggled along for three years & then got married on June 6th 1888. Elmer had enough to buy a little furniture & we got an upstairs apartment for $6.00 a mo. Undoubtedly, the Curry/Moody joint venture in the cigar store/new stand contributed to the bonding of the families. By 1887, Elmer had become a member of Jack's outdoor camping organization, the Forest & Stream Hunting & Fishing Club, and Mame was among the female day guests entertained during the club's three-week summer campouts. The fact that Frank Curry worked as a close associate in the cigar store building with Elmer Moody is a further reason why he may have found it a congenial idea to later relocate to the Santa Barbara area. The Moody linkage in the cigar store business may also provide a hint to the identity of the elderly man on the right in the photo. Is this the father of Elmer and Ed—Robert Ewing Moody (b. 1827 - d. 1900) who was the same age as William Ezekiel Curry? Would be great if our Moody relatives could surface some other photos of R. E. Moody to confirm or deny this hypothesis. Wow, what a fun trip this was to rediscover the lives of these all but forgotten people and preserve their stories for future generations! It's amazing how a beat-up old photo, like a Hardy Boys secret clue, led step by step to a trove of family history. Best of all, was the appreciation I gained for the pluck and perseverance of our ancestors as they struggled in the face of dire economic conditions and other life challenges. 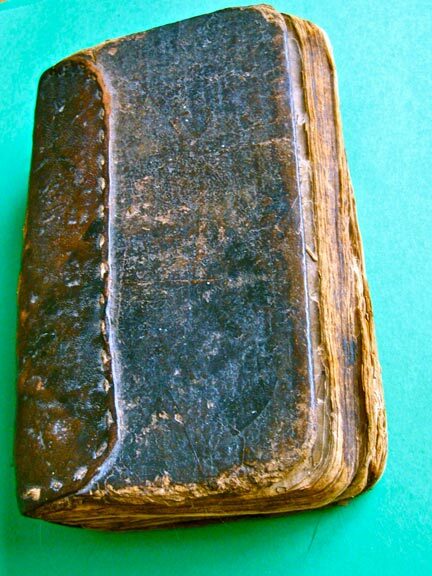 One of the most curious objects of family memorabilia that has come down to me is an ancient and weathered book that, according to my father, was the property of my Great-Great-Grandfather, Dr. Joseph Curry (1778-1861). The reported chain of possession is from Dr. Joseph to son William Ezekiel to son William Jack to son William Jack, Jr. to son William Jack, III [me--for now!]. The 7" x 4.5" volume is in a tattered state of musty decomposition that testifies to its old age, hard use and exposure to the elements. If my hypothesis about this book's history is correct, it bumped along many miles in the back of a horse-drawn wagon during the family's westward migration on the wilderness trails over the Allegheny Mountains. The leather spine, burnished by passing through many hands, retains a still-glossy patina. You can see that at some point in the distant past it was rebound by a person who must have valued it highly. The rebinding was crudely performed by hand-stitching a thick-ish piece of calf or sheep skin to the now-crumbling cover boards. The binding has broken away from the glued spine and the stitched sections are all but falling out. Inside, the pages are heavily foxed and stained. Both the front title page and endpapers are missing although there is a tantalizing inscription (unfortunately not readable) on a remaining fragment of the rear end paper. 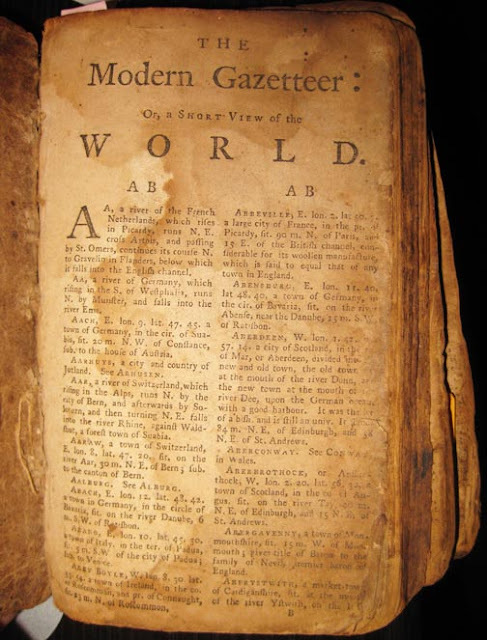 While all the front papers are missing, it's fortunate that the title, A Modern Gazetteer, or, a Short View of the World, is repeated on the first page of what's left (though nowhere else in this copy). Following the title is an alphabetized listing of geographical places with a now-quaint description of each, usually with a latitude and longitude fix appended. The typography employs the old form "long S" which looks to modern day readers like the letter "f" without the crossbar. The long S went out of usage around the end of the 18th century so, first off, we can safely guess the book was published before 1800. Aarhuys, a city and county of Jutland. Baranco, W. lon. 75.30, lat. 27, a port town of St. Martha, in Terra Firma, fit. on the river Grande, 30 m. S. of the mouth of that river, and 75 mi. N. E. of Carthagena; the fee of a bifhop. America. Boston, W. lon. 70.25, lat.42.34. the capital of New England, in America, fit. on a peninfula at the bottom of a fine bay, covered by fmall iflands and rocks, and defended by a caftle and platforms of guns which render the approach of an enemy very difficult. It lies in the form of a crefcent about the harbour, and the country beyond rifing gradually, affords a delightful profpect from the fea. There are ten churches in the town of which fix are independents and the number of fouls is computed to be fourteen thoufand, and it is one of the most flourifhing towns of trade in N. America." As I peruse the geographic entries I see that many of them contain a date reference or other information that could place the book in time. For example, each of the British colonies in America are described at some length so we know the book was published before 1776. 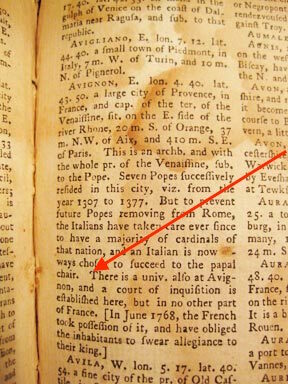 Since this sentence was inserted in brackets at the end of the Avignon entry, it appears to be a "late-breaking news" annotation slipped in just before publication. Bottomline: We now know the book had to be published after June 1768. Since Dr. Joseph Curry wasn't born until 1778, it is reasonable to conjecture that the book was bought by his father, Moses Curry, who, according to family legend, was "born on the Ocean" sometime in the 1730's. Another hypothesis is that it came down the generations from John Finley to his daughter Jane (Joseph Curry's wife) but Finley was only ten years old when the book was published in 1769. The next question I ask myself is, "Why would this book be of any special importance to Moses Curry or his son Joseph"? Assuming the book was bought shortly after publication, circa 1769, Moses would be a Chester County, Pennsylvania carpenter and yeoman farmer in his mid-thirties with a young family (he married circa 1761 based on the birth year of his first-born son). The British Colonies were in the run-up to the Revolutionary War and knowledge of world events would be essential to understand the forces in play on the world stage. Moses would soon be in the thick of it--the Battle of Brandywine in 1777 was fought and lost by the fledgling U. S. Army only nineteen miles from his farm in New London Township. The Modern Gazetteer: or, A Short View of the Several Nations of the World: Abfolutely necessary for rendering the public news, and other hiftorical occurrences, intelligible and entertaining. : Containing, I. An introduction to Geography; with Directions for the Ufe of the Terreftrial Globe. II. The Situation and Extent of all the Empires, Kingdoms, States, Provinces, and chief Towns, in Europe, Asia, Africa, and America: also, a Defcription of the moft confiderable Seas, Lakes, Rivers, and Mountains, all ranged in Alphabetical Order. III. The Produce, Manufactures, Trade, Conftitution, Forces, Revenues, and Religion, of the feveral Countries. IV. The Genealogies and Families of the Emperors, Kings, and Princes, now reigning. Comparing my volume to the complete, Internet version shows that mine is missing the first section on geography, the descriptions of the major economies of the world (especially England), the review of British parliamentary procedure, as well as the "New Set of Maps". This information would been of great value in teaching the basics of physical and political geography to an uninformed reader. As such it could provide a key to the vast and mysterious world lying beyond the frontier hinterlands of New London Township, Pennsylvania. Except for the Holy Bible, books were not that common in rural areas and it's understandable that a mini-encyclopedia like this would be highly valued and kept as a reference book. While it helped inform the world view of a man who would ultimately see service in the Chester County Militia during the Revolutionary War, I can also imagine that his eight sons read this book during their formative years. Given this hard use, it's not surprising that the maps and basic geography section were lost as the book fell apart. Alternatively, this content might have been intentionally removed as reference material by someone. Moses’ fourth son, Moses(2), who went on to become a surveyor and school teacher, would be a possible culprit. At some point the pages remaining were rebound and, from the width of the spine, it appears that this rebinding never held the forty-six lost pages. Moses Curry farmed until the late 1700's on ninety acres in southern Chester County, left to him by his father, Samuel Corry. Moses migrated to western Pennsylvania (Mifflin Township, Allegheny County, PA) at the end of the 18th century with four of his sons including Dr. Joseph. Moses passed away there in 1822. He and son Joseph are buried in the Mifflin Presbyterian Cemetery located at the western end of the Allegheny County Airport's main runway in the Pleasant Hills area south of Pittsburgh. My summation: The very fact of this book's survival over several generations of Currys suggests it had special sentimental value to its successive holders. Imagine, caring for a book so much that you hand-stitched a piece of animal hide around it to replace its broken spine! While lacking definitive, chain-of-title proof, it's my current hypothesis that the known Curry line provenance and the 1769 date of publication suggest that Moses Curry, my Great-Great-Great-Grandfather, was quite likely the original owner. He could have readily purchased it from one of the book vendors in nearby Philadelphia. Now suppose you had grown up browsing through your father's treasured copy of The Modern Gazetteer by flickering firelight down on that long-ago farm in eastern Pennsylvania, and, years later, when you are winding up your deceased father's affairs, you come upon that beat-up but well-remembered book among his meager effects--wouldn't you clutch it to your heart for all the special memories it brought to mind? I like to think that this is what actually occurred, and when I hold it, I too can feel that unbroken chain of love and caring of sons and fathers that brought it to my hands. Someday in the not too distant future I will be happy to entrust this book of 240-plus years to my son, Quentin, as evidence of that very same love and he will have the privilege of passing it on, likewise, to my beloved grandson Mason Curry. 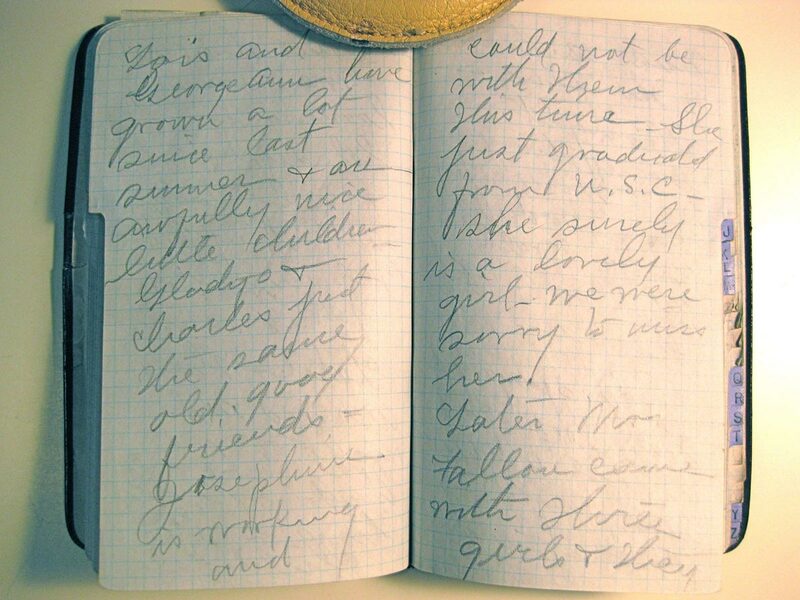 [Provenance & Notes: This diary was loaned to me (William J. Curry, III) for transcription by my cousin, Brenda Moody Wales, during my visit to her home in Corvallis on 14 Jan 2008. It was passed down to her from her Aunts, the four Moody sisters who received it from their mother, the diarist Mame Curry Moody. 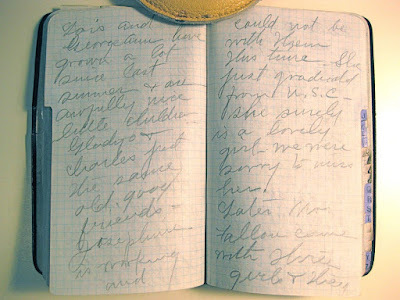 The diary was written in pencil and often difficult to decipher, esp. name of friends--corrections and edits are solicited!